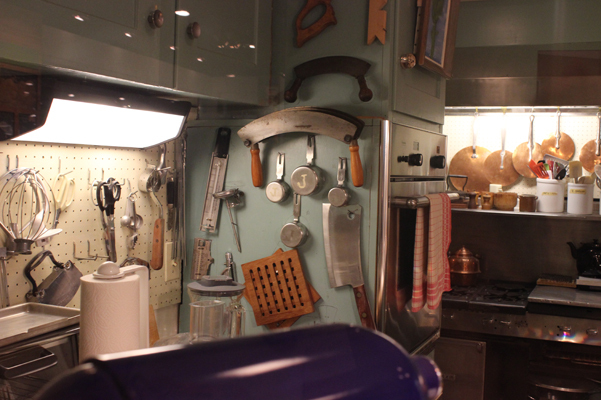 That, my friends, is Julia Child’s kitchen, transported in its entirety to the Smithsonian Museum of American History, and reason alone to take a trip to Washington DC. Check out the saws on the wall! This amazing sight was part of the FOOD exhibit, which was of course a highlight for me. 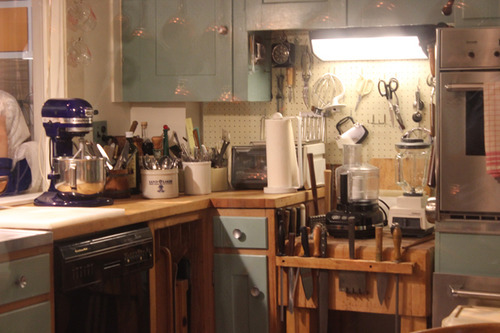 I learned that Julia was over 6 feet tall, and her husband raised all the counters up to make it more comfortable for her to cook in her own kitchen. 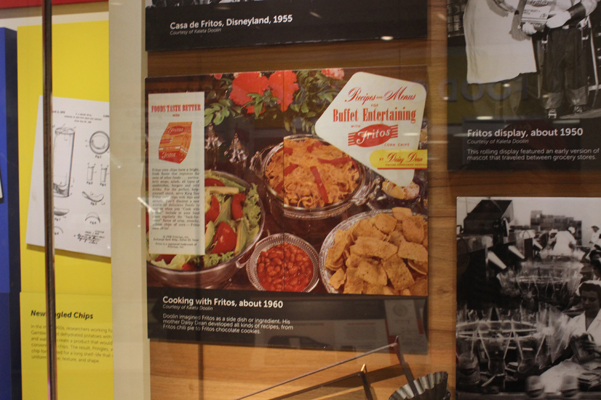 The FOOD exhibit also included some useful information on the history of Fritos. And yes, “fritos” means “little fried things”, which is a very apt description. Our first food stop on our first day was an amazing little bake shop just a few minutes from our hotel, in Dupont Circle. 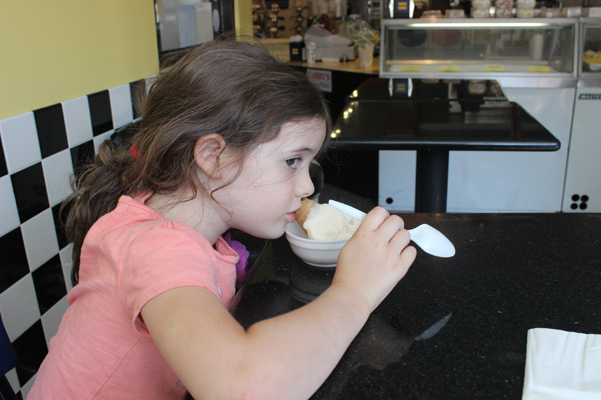 Nathaniel went for the Root Beer Float and Juliet chose a simple honest vanilla. 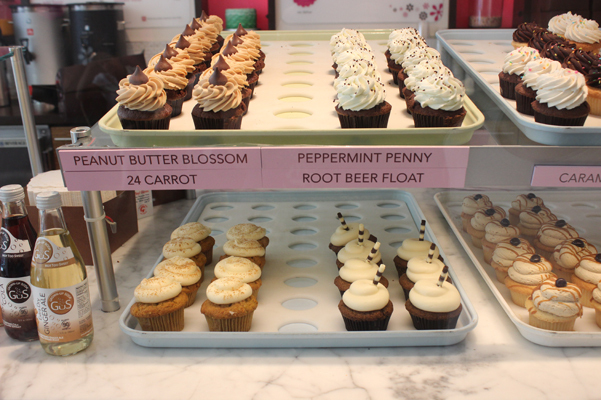 We went back the next day and got three of them, so I could try the Peanut Butter Blossom. As the extremely friendly man behind the counter was packing them up, he told me that he had put another one in our box for free! 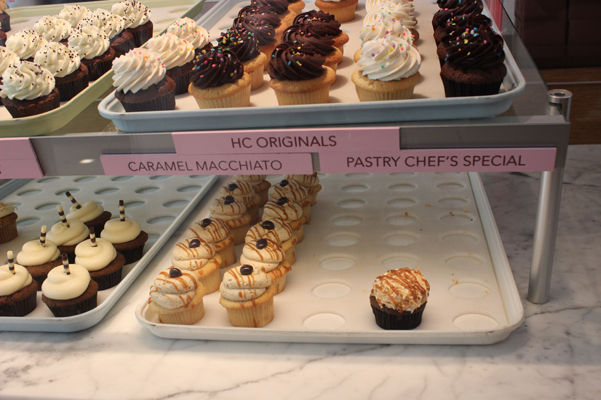 We saved that incredible Caramel Macchiato cupcake for our last day, adding it to our breakfast. Delicious. 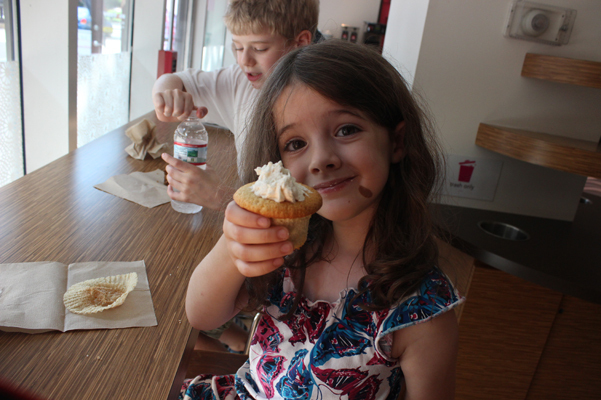 I had no idea there was a free cupcakes policy in DC, but I approve. 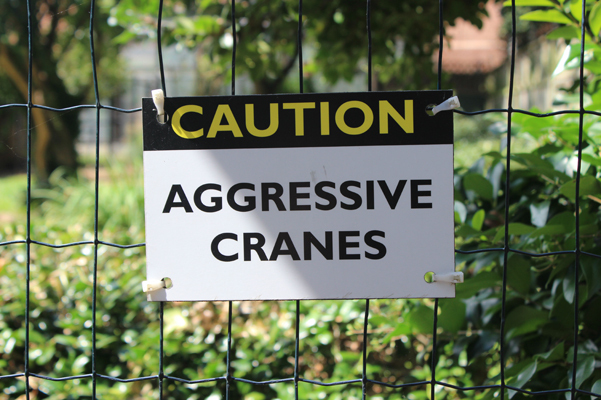 This sign was on the same street, just down the block a bit. 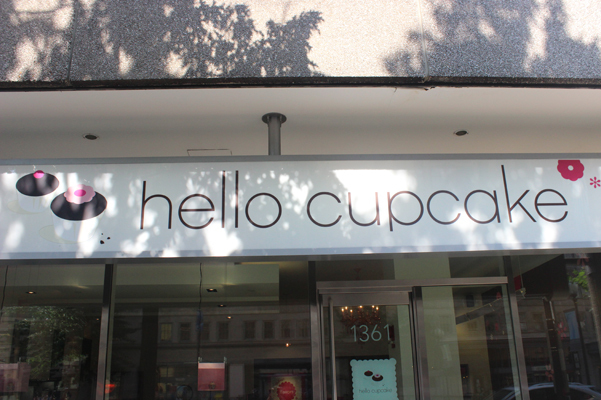 I couldn’t help but wonder if the tattoo shop’s proximity to Hello Cupcake helped inspire the name. We explored the neighborhood for a while, then hopped on the Metro to a place I’d read about called Tonic to have our first dinner in DC. There’s a really interesting history of the place, which you can read more about here if you like. 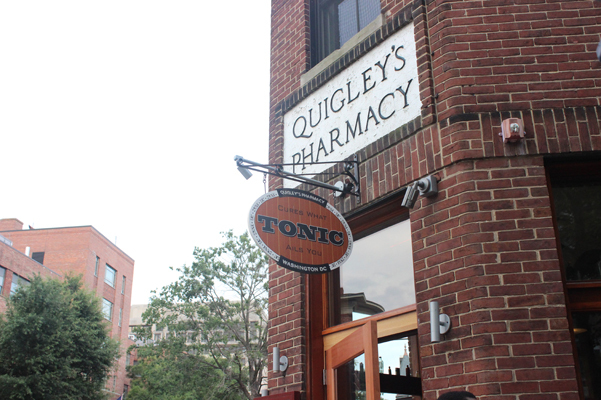 It’s right in the Georgetown University neighborhood and Quigley’s Pharmacy was founded by a recently graduated pharmacy student in 1891. He branched out to burgers and Cokes after that. 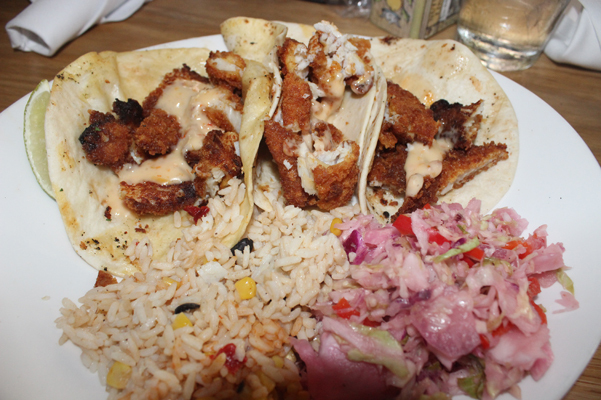 The coconut rice didn’t have much flavor, but I devoured everything else, and although I’m normally not much of a slaw eater, I stuffed each taco with it once I had my first taste to make sure I’d have it in every bite. 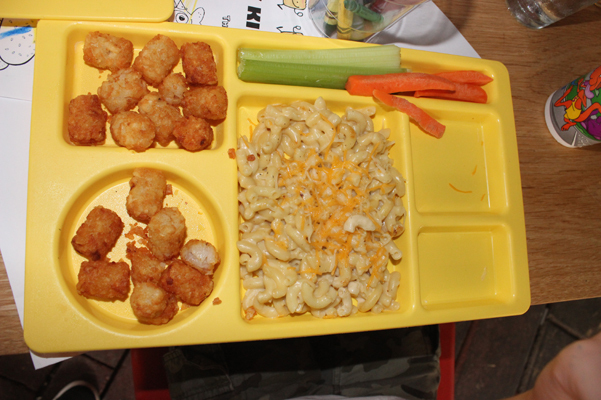 Dave had the friend chicken, and the kids had cute little platters of macaroni & cheese and chicken fingers with tater tots, which was a new discovery for them due to the lack of such things in our household. 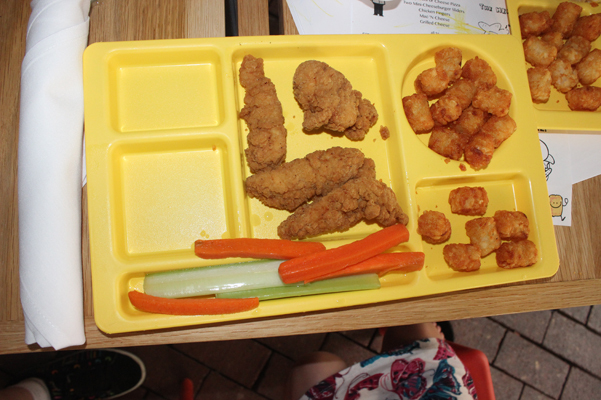 The kids liked the trays too. 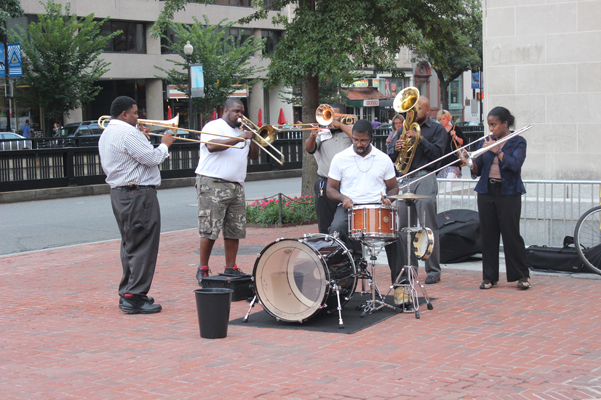 It was still light out when we stepped back off the Metro at our stop, and we were lucky enough to catch this great little jazz band playing in the street. Everyone within earshot was dancing. We saw people bopping along from a block or two away as we made our way back. Fun! 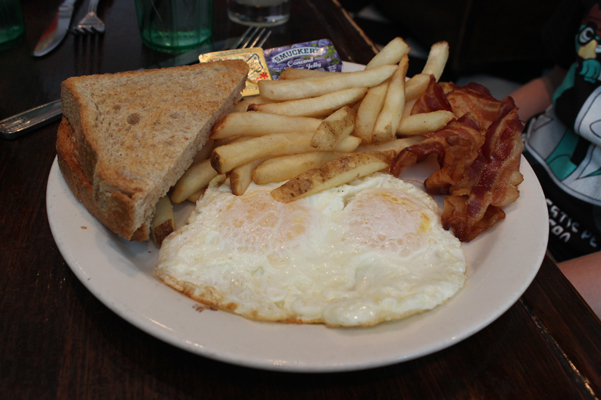 We started off Day 2 with a free breakfast at the hotel, which I never photographed because it was just too bleak. It never got any better. Every day it was free and every day it was vile. Thank goodness I’d brought along some of my own homemade baked goods, and the kids always managed to find something amidst the rubbery eggs and oddly textured waffles. 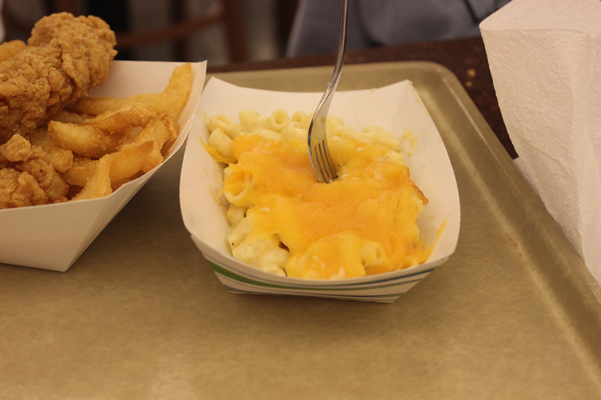 Lunch on day two was not a huge improvement on breakfast. 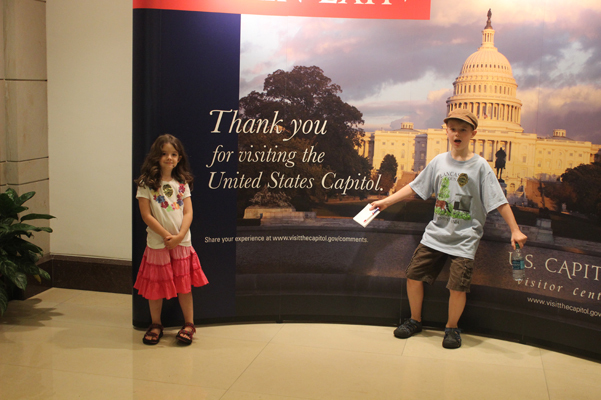 We’d just gotten an incredible tour of the Capitol Building from our friend Joe, and then we walked past the cafeteria and it was all the kids could think of, so we caved and went in. 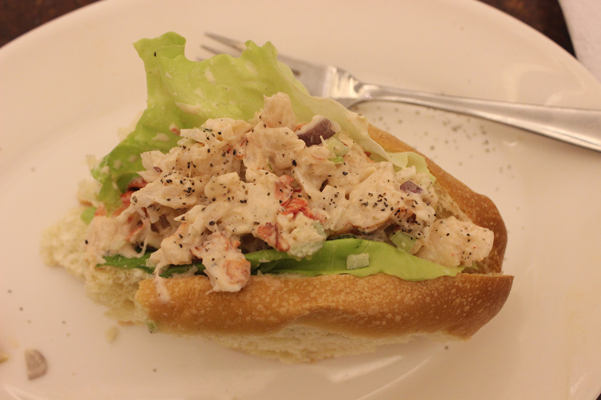 I have no idea what made me decide that getting a lobster roll at a basement cafeteria was a good idea. Looks okay, right? It wasn’t. It was like eating a salt sandwich. Salt was the only flavor present. 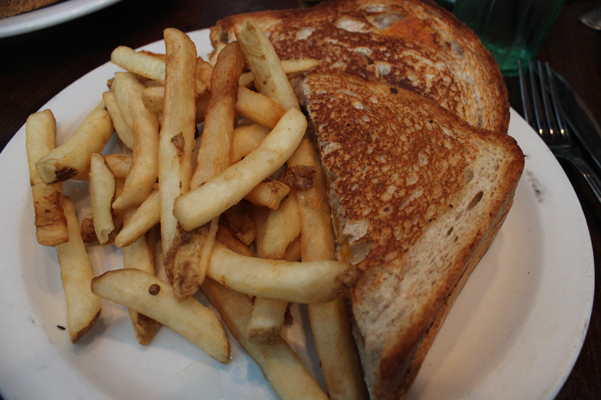 I ended up just eating the bread around it just to keep myself from going hungry (or dying of salt-inflicted thirst). 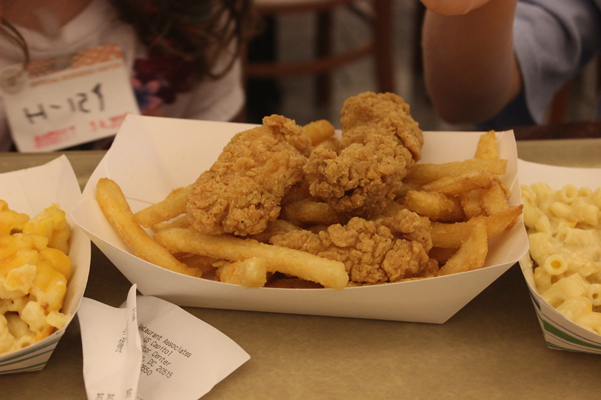 The chicken fingers look the same everywhere, by the way. 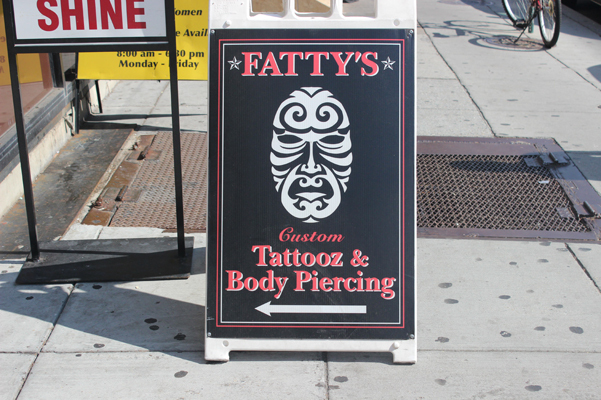 There must be one supplier in all of DC. We stopped by the shop on the way out to get little notebooks & pens, and then hung around outside for a while. 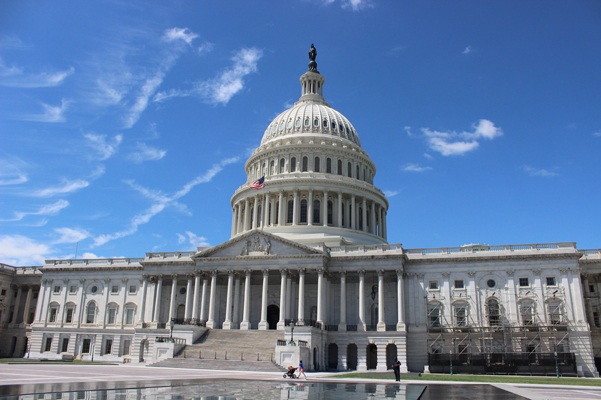 The Capitol Building is a majestic sight, and we’d been lucky to get the insiders’ view of it. 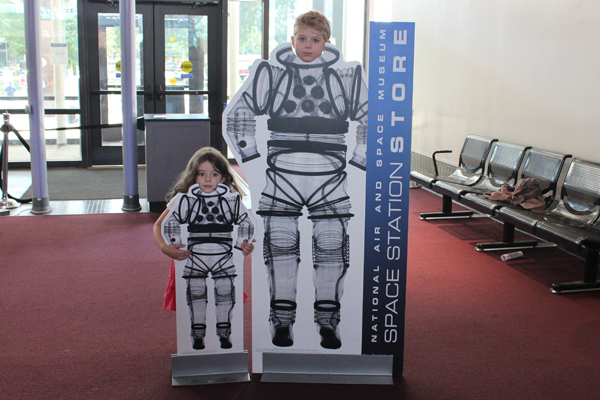 We stopped by the Air & Space Museum next, but it was a little hard for a 5-year-old to get as excited as the rest of us about seeing The Spirit of St. Louis, Apollo 11, and the Wright Brothers’ first plane. Juliet finally had a catnap while we watched a movie at the Einstein Planetarium and then got some energy back just as we were leaving. We started the next day with another substandard (but free) breakfast, then headed to the Newseum, which I highly recommend to anyone visiting DC. Dave & I could have spent days there, but it wasn’t perhaps the greatest place for Juliet. 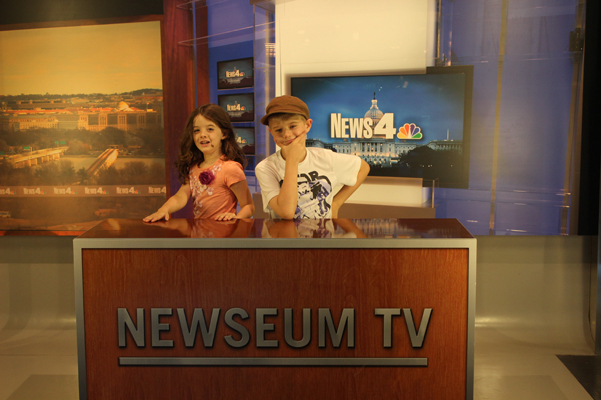 She perked up once we got to the section where kids could record their own news broadcasts, though! 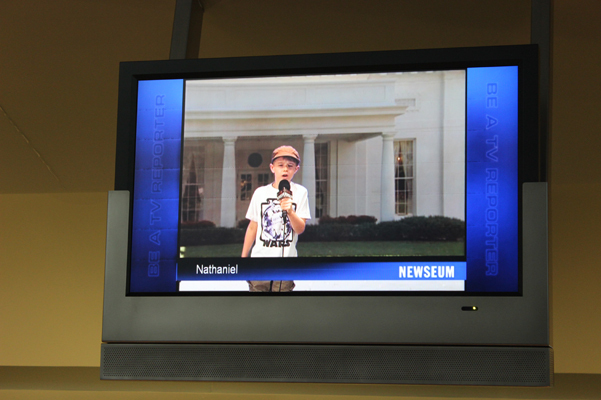 Sadly, the food at the Newseum did not match the quality of the exhibits. 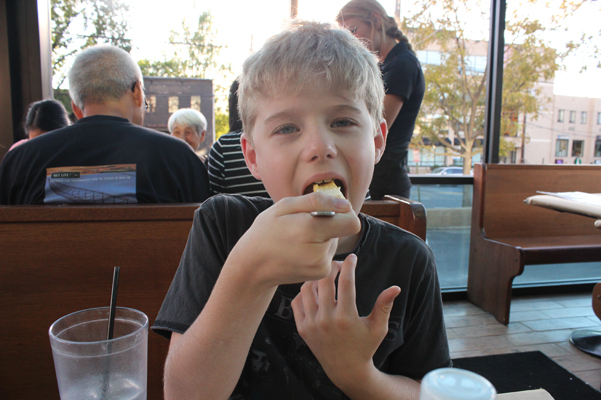 This was another time when I forgot to take pictures, but I’m pretty sure Juliet had the chicken fingers again (again!) and I had a salad and a fairly innocuous personal pizza. 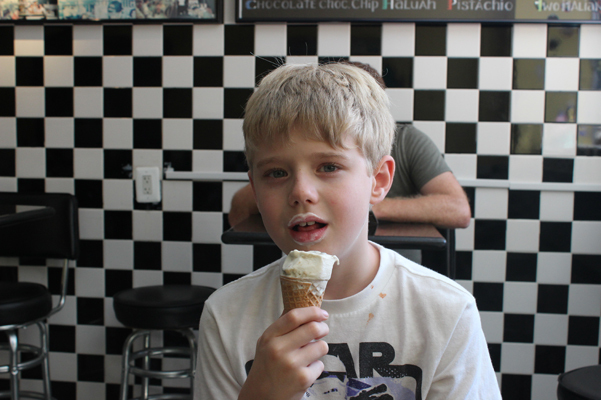 But later that day, once back in our neighborhood for a rest, I took the kids on a little outing to Larry’s Ice Cream. It was a worthy outing. 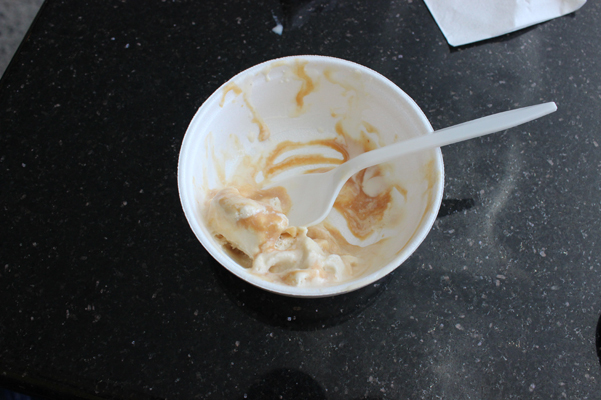 Juliet had vanilla, Nathaniel had cookie dough, and I had salted caramel, all homemade, all delicious. I don’t care how trendy salted caramel gets, I will always love it with all my heart. We somehow managed to save some room in our bellies, and it was well worth it. 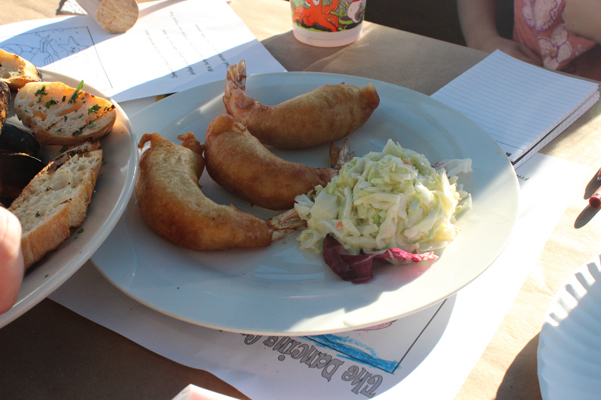 I’d read about The Dancing Crab on the Food Network’s website, so we made a little trek to check it out. The neighborhood wasn’t much to speak of, but the crab was definitely worth dancing about. 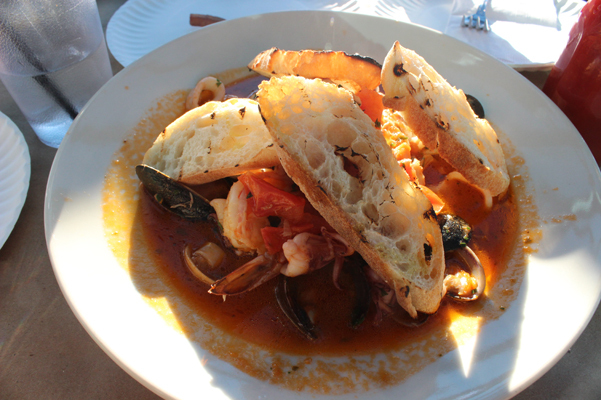 We sat out on the patio, the wait staff could not have been nicer, and the food Dave and I ordered was delicious. 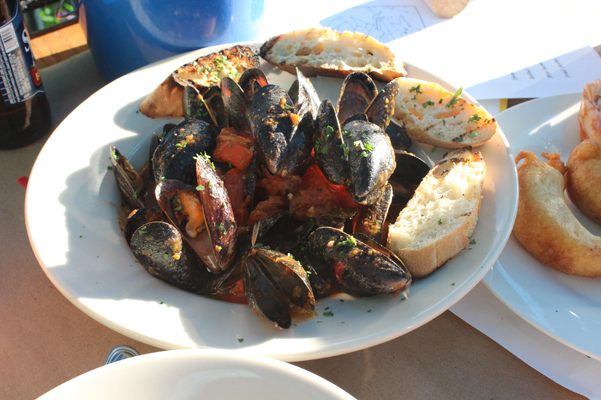 Dave had mussels, and I had a seafood stew, filled with crab, shrimp, fish, clams, and mussels floating in a spicy broth, topped with garlic crostini. It made up for every salty lobster bite and and every chicken finger. 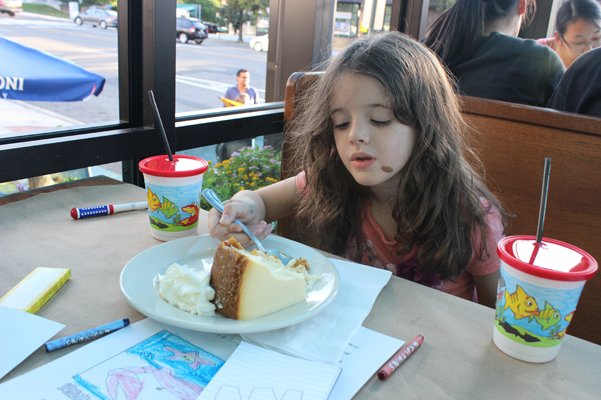 The kids’ menu wasn’t spectacular. 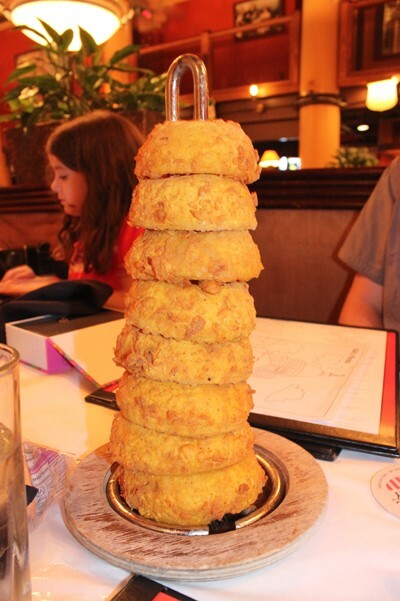 We got fried shrimp for Juliet, which she loves, but the batter was too thick and we didn’t blame her for not wanting to eat it. 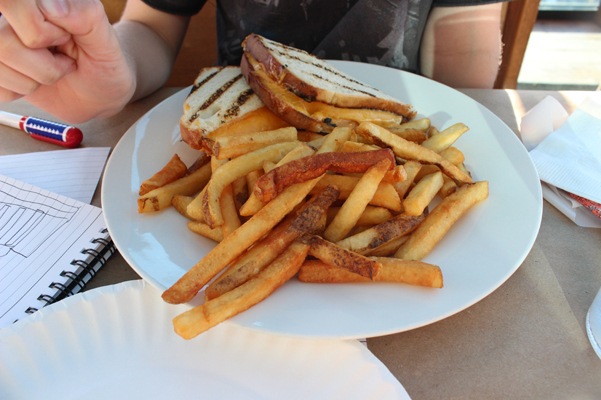 Nathaniel ordered a grilled cheese and fries. 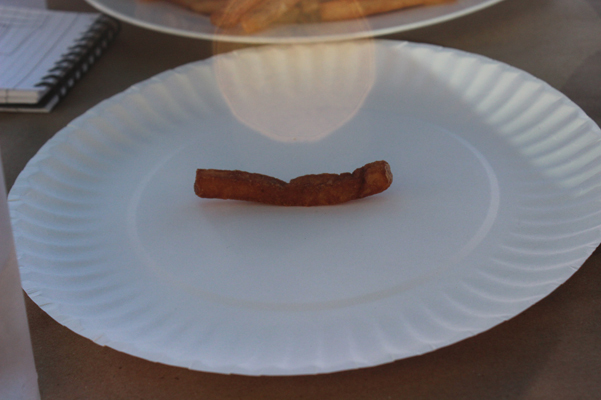 The fries were so perfect that Nathaniel picked out his favorite one and moved it to a separate plate so he could save it for last and savor it. 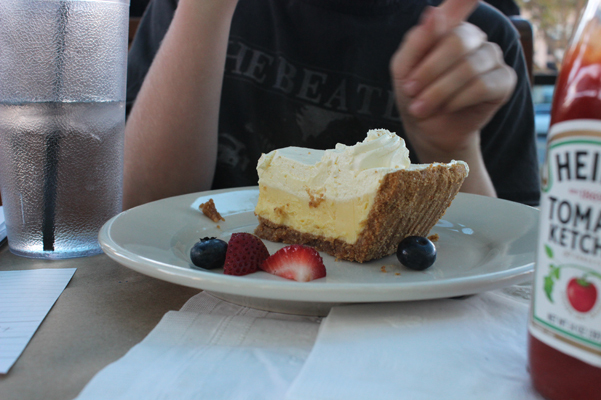 Nathaniel very graciously switched plates with Juliet once we determined she wasn’t interested in the shrimp, and since they were both so sweet about making sure there was enough food for both of them, we let them order dessert as well: cheesecake for Juliet and key lime pie for Nathaniel. 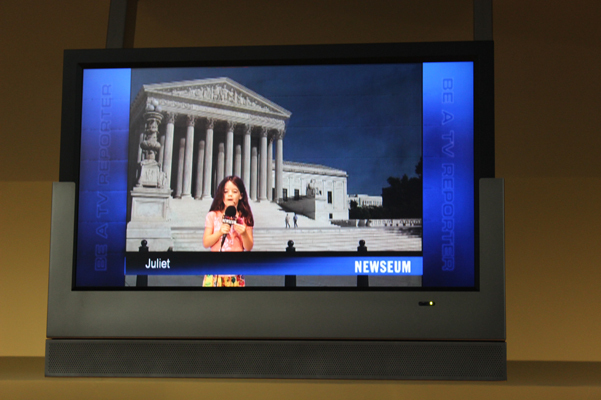 The next day was our last full day in DC, and we started it off at the FOOD exhibit already mentioned. 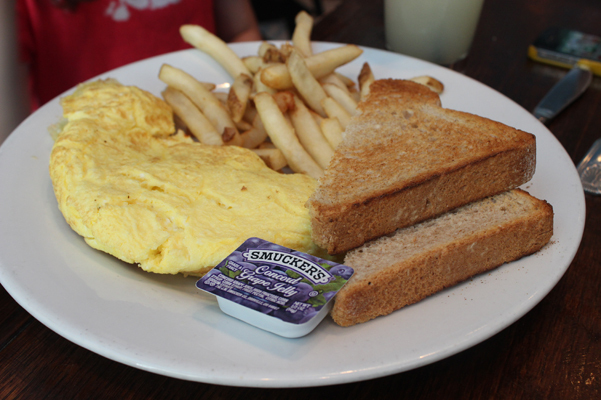 I loved it all, of course, as well as the other gems they had at the Museum, and instead of giving in to the convenience of museum cafeteria food, we headed back to our neighborhood for a cheap & easy diner lunch. 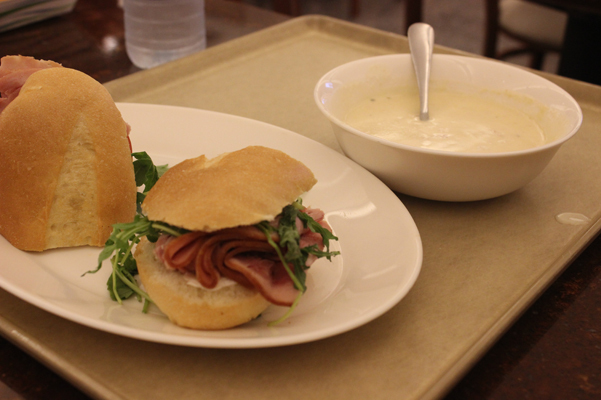 Simple fare at a reasonable price. Sometimes that’s just what you need. 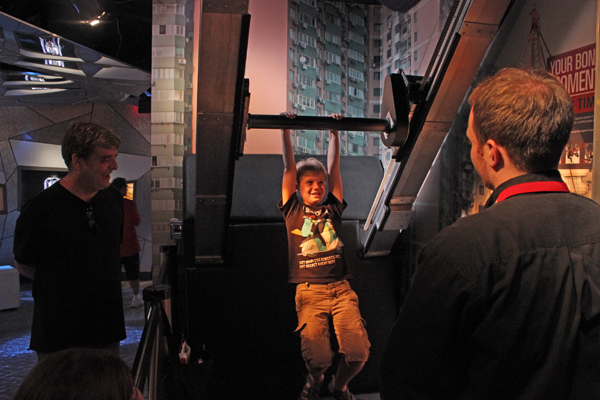 We had a fun time at the Spy Museum that afternoon. 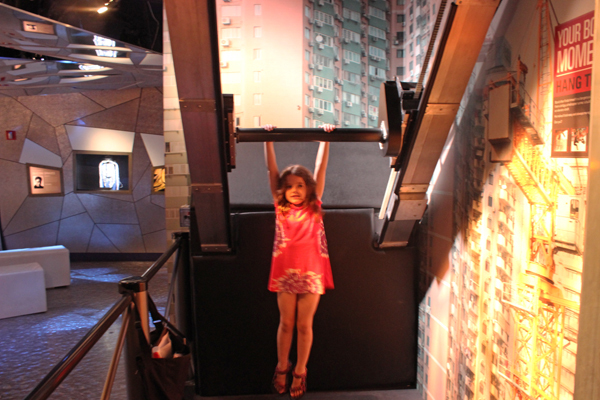 Juliet was bored until she got a chance to hang from a pole like James Bond, with the wind blowing at her! Nathaniel did it too, but Juliet went back four or five times until she could stay up there for at least 30 seconds. That night we had dinner with the lovely & talented Meisner-Eagle family at the District Chophouse, about a block from the museum. 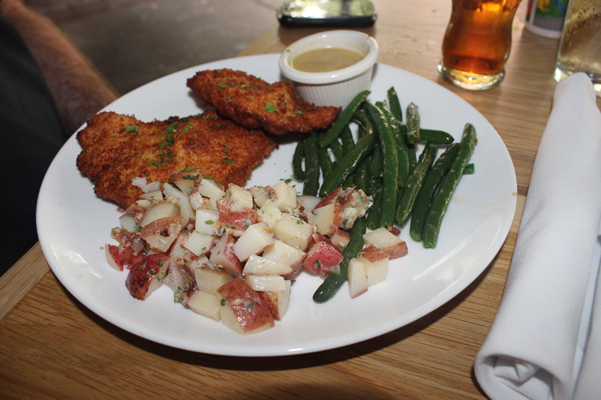 I forgot to photograph the entrees, which is a shame because my baked potato was bigger than my head and my fish sandwich was delicious. 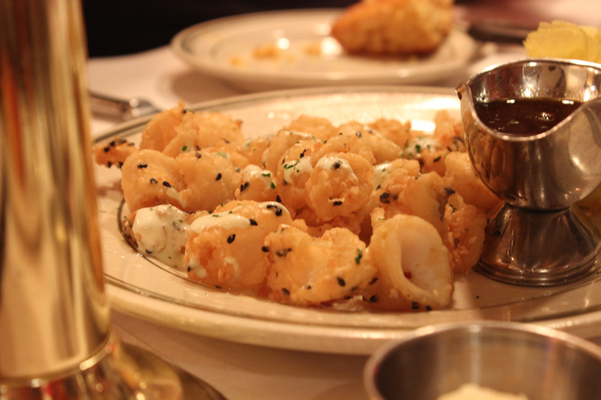 I did get a crack at the appetizers, though. 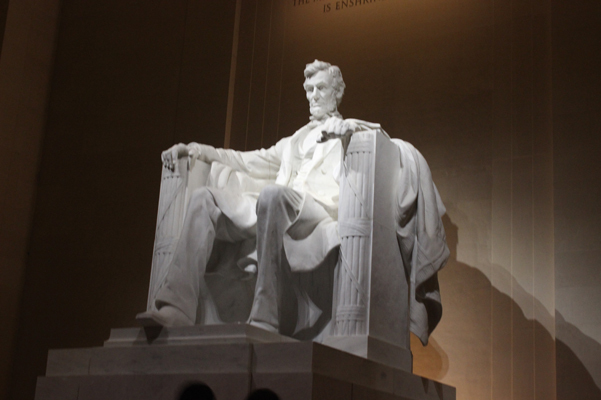 We spent our last night checking out some of the classic, majestic monuments of DC. Our last morning away, we skipped the free breakfast and bought breakfast at a nearby bagel shop. For $20 total we had fresh bagels, real eggs, and pancakes. Woohoo! Our last few hours were spent at the zoo. I’m so glad Nathaniel suggested taking the train to DC for our vacation! Smart kid.